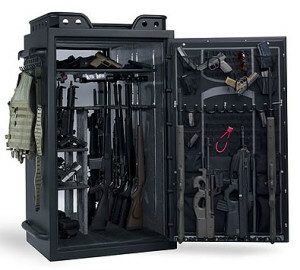 There are a variety of ways to store your firearms safely at home, but none of them are completely foolproof. Every situation is unique, and there are a number of considerations to factor into your choice including budget, accessibility of the firearm, and local gun safety laws. As always, store ammunition separate from firearms, and ensure that neither are accessible to unauthorized persons. If you own a firearm for personal protection, then accessibility and safety is critical when not in use. Eleven states currently have legislation regarding the use of locks or firearm safes. Some types of firearms are required to have locking devices. Check with the state and federal laws regarding your particular types of firearms to see how they impact your choice of storage. The bottom line may be what your budget will accommodate. The following storage options give you an idea of the choices you have for safe storage at home.